In Astrology and in Vedic literature Saraswati is considered as the Goddess of Speech/communication. So the mantras I am going to explain below are also devoted to Goddess Saraswati. If both the below mentioned mantras are recited everyday (108 times each) with devotion and faith, there will be a sureshot benefit. I have given these mantras to many people and almost all of them got benefited. And those cases where there was little benefit, there was a lack of faith and devotion. Early morning is preferred time to recite these mantras but if for some reason you can not recite it during morning, you can recite it later during the day. Sit on the floor on a red color blanket or bed sheet facing east direction and start reciting the mantras. If you are reciting it for someone like your child or someone else, then generate this thought in your mind (Sankalpa) that you are reciting this mantra for (name of the person) who is your (name of relation). You are reciting the mantra for his/her benefit and the whole benefit of this recitation should go to him/her. If you are doing the recitation for anyone else then you will have to generate this thought daily every time you sit for the recitation. These mantras are excellent even for students. It helps them in retaining the knowledge, concentration and improving memory. SIR,will this mantra be benefical for those who are in marketing field?? Of course, it will be. THANKS,a lot SIR for this wonderful information!! but plz suggest me when to start or which particular day and time?? Please start it from shukla paksha Wednesday morning. Pl wapis aa jaaye aisa koi tareeka bataayein aur uske baad grhsth ki tarah pati ki tarah theek se rahein mere saath usks tareeka bataayein. sir, at what time / day of the month should we start chanting this mantra?i mean shukla paksha or krishna paksha and which tithi? i want to do it for my son who is 6 yrs and has speech delay. My son is going to,b two and is not talking yet, can i chant this mantra for him. Yes of course. It is a very powerful mantra if recited with complete faith and devotion. Im tamilian, my son is going to be 4yrs old has speech delay problem and not listening and concentrate to us. When should i start this mantra?? Aap ise recite kariye apne bete ke liye. Jab tak asar na ho tab tak karte rahiye. gaurav ji, i have started this mantra starting from wednesday shukla paksha as told by u for my son who is 6 yrs old and has a speech delay...i m seeing some positive effects also...pls tell whether we have to stop doing this jaap on my monthly period days or not? also if we can't do this jaap at that time then when can we resume?pls reply...if we go out somewhere, can we do this jaap at someone else's place also to mantain continuity? You can do this jaap anywhere. You can keep doing it during periods as well because you are doing it for your son. Dowe have to recite both of the Mantras or any one of it , and Please do tell me when should i start doing it , I want to do it for my son of 2 + years and who has a speech delay. Both the mantras should be recited and they are magical mantras if recited with complete faith and devotion..many people have got benefited by them. You can start reciting them from 18th Sep.
can this mantra be recited during pregnancy? I want to recite for my first child. Yes, but please take a sankalp in your mind before recitation that you are reciting the mantra for your son whose name is ____ and the whole benefit of this recitation should go to him. Gaurav ji. mujhay bhut jayda haklany ki problem h aur mujgay bilkul bhi batay nahi ati and baty kahya hu to itna unimpressive way say nikalti hi samny wala mujhay asy hi samajta h respect nahi deta. ladko ki bato ka us time koi bhi answer nahi dy pata or meri marpeet ho jati h ghar anay kay bad sochta hh ki us ladko ko y kahna xhahi tha vo kahna xhahiy tha lakin us ladkay say bat karty time bilkul bhi mind nahi chalta. meri age 25 years h. kya meri provlrm ka in mantro say solution hoga main apki jivan bhar apmi puja karuga. please sir. Haanji hal bilkul niklega in mantron se. guru ji rahu beez mantr ko 40 dino may 18000 jaona jaruri h kya? or guru ji kya metod h, koni mala lani hogi or jameen par bathna jaruri h kya kyo ki yatra main y posible nahi h, cloth saf hony jaruri h kya? rahu beez mantra and any other beez mantra japny ka easy method nahi h kya jisay her situation main apply kar saky kyo ki guru ji jayda niyam wali chijy jayda time tak tikti nahi h. plesae guru ji solvelve my and this general problem. Hello Gaurav ji...when should i start chanting these mantras for my son who is 3.5 years old and hasnt started talking yet? Please start it from shivratri. Also make him wear 3 mukhi and 4 mukhi rudrakshas around neck in black or red thread. You should start it from shivratri. Rudraksha would help further in the problem. In that case you can have thick and strong thread iin the rudraksha. Please recite both the mantras daily. Also wear 4 mukhi and 6 mukhi rudrakshas. Namaste pl advice when is the best day/ date to start chanting these mantra. I want to do it for my 3 and half yr son. He doesn't speak very clear. You can start it from 2nd March. Thank U so much Gaurav ji .. I can see positive results already . I'm glad to hear that. It has already benefited so many other people as well. Namaste Guruji. My son is 7 years old and he speaks word by word, not the full sentence. Shall I start these Mantras ? what is the good date to start ? 29th August is a good date. Namaskar guruji, my daughter is 4.5 year old. She used to speak in sentences when she was 2.5 years old.I don't know what happened but now she has lost this skill. Doctors say that she has had regression, and its autism. I would like to recite these mantras for her, kindly tell me when shall I start. Please start from 9th Sep between 6AM to 7AM. Namaskar Guruji, my daughter is 20 months old and hasn't started talking yet. I would like to do this Mantra for her. Would u pls advice when should I start the recitation process? Please start it from 14th October. can I start it on 21Oct15 (wed)? Sir I am planning to do it for my daughter who has speech delay. Please suggest a good date.thank you. Namskar sir My son is 7 years old & not talking or I can say talking with me only but words not clear at all & voice is also not clear.. Nor he wants to make friends neither he has any hobby like no motivation for life. He knows writing, reading from very young age but doesn't do in school. And my younger one who is 2 is speaking but very less nd not clear..though he is very smart too. What should I do for my kids? Thanks .. In the mean time please start doing the above mantras for your kids. Namaste Guruji. I want to start it for my son who is 17 months old. Might not be a speech delay case as he is still small, also not that i want to pressurize him to start talking soon, but I just wanted to know if reciting the mantra would be helpful to him in achieving the skills over time whenever he starts speaking. Also, from when can I start reciting? Yes of course. Please start it from 27th December between 12pm to 12:30pm. Namaskar Guruji, My son who is 7 year old. He is not speaking clearly and sentence making is also not proper. Shall I start these mantra ? what date will be good ? guruji..i want to start this mantra for my child who is 7 years old now.when should i start? Guruji my son is 2.5 year old and seems getting tired very easily. He eats well but does not put on weight at all. Is there any way to increase weight and stamina? Thank you panditji. I am very introvert person which is disturbing me psychologically. Will reciting these mantras help to overcome introvertness? Resp,Guruji, my daughter Name: Annu DOB: 17 Jan 1993 @ 0.30AM place: Dharwad(karnataka)completed MCA in Oct 2015. struggling seriously for job and life settlement.Kindly advise. Yes you can recite the mantras given above for him. Please email me at jyotishremedy@gmail.com if you want me to study his horoscope as well. thanks Gaurav jee. Which day shall i start reciting this mantra? Hello sir my son is 5yrs old he had speech delay but now he is able to make sentences but he finds difficult to say few sentences New to him and he is not able to express much like what happened in the school who are your friends finds difficult to remember letters and numbers will this mantra help if so when can I start this mantra? The above mantras will be very beneficial for him. Please also make him wear an emerald. Hi Sir, My son is 5 years old and does not speak.. He had spoken the numbers 1-10 and 2-3 words of poems at the age of 1.5 years. But gradually when he touched two, he stopped speaking completely. We did loads of therapies that are still going on but speech is still delayed. He has been diagnosed with autism. Please suggest what should be done. I read your posts and have started "Om Vad Vad Vaagvaadini Swaaha (108 times)" last year in april. You can start it from First navratra. my son 4.5 years old and has no speech at all. He has no interest in learning. He has been diagnosed with autism. I have made him wear an emerald laSt year. He is on therapies for past 2 years but hardly any significant improvements. 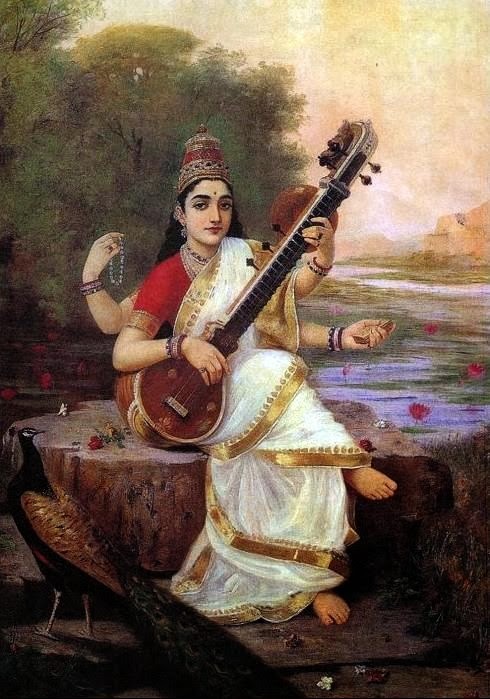 Am going to chant the Saraswati mantra. Could you please tell us when to start. His birth date is 24 Apr12. Also could you please let me know any other things that I have to take care. Thanks a lot. You can start from 10th or 11th October. Is it compulsory to recite both mantras or it is sufficient to recite any one mantra from the above two? Please confirm. You can recite any of the two mantras. Sir, my daughter is 2 and half years old not yet started speaking. If I do in the early morning is it necessary to take bath and do pooja? Or as it is after getting up can I start? Pls suggest me the best time to start? Morning is best time if for some reason you can't take bath it's fine. Faith and devotion in heart is more important than external cleanliness. My son is 3 yr old. 15 nov. Is his birth date. From which date i should start this on which maala?? Namaste Guruji,my son is 3 years old.i live in California.he has speech delay and mildly autistic.kindly let me know when us the good day to start pooja and mantras. Please tell me from when to start at the earliest. This can be started from any shukla paksha (Waxing moon period) Wednesday. Please start from 26th June. Auspicious muhurta on this day is till 5:15AM. hello sir my son is 3 yr 2m old he speaks few words,he has mild autism.plz tell when to start reciting mantra s and how many days we have to do Thanks . You can start from a shukla paksha Wednesday. Do it till she fully recovers. Also consider this yantra for her. �� sir mera beta 4 saal ka hai abhi sentence nahi bana pata hai ish mantra kaunsi date Sai start karu. When is a good day to start these two mantras for my 4.5 year old daughter who is not talking at all? My son Vidyuth is 2.9 years old and he is still not speaking. I have already started chanting this mantra. How soon will this take effect? It depends on your faith and devotion in the mantra. It has given miraculous effect to many people. If i send his horoscope to you. can you please tell me how the planet positions are and if i need to do a pariharam for him. Namaste, My son is 5 yr old. He is not communicating much with us much by using sentences. He is using words than sentences for communication. Sometimes he even forgets the words and struggle to communicate. I am afraid that he will get diagnosed as Autism or something serious. His birthday is December 11, 2012 at 12.36am. Place - houston, tx, us. Will he talk in future like other people? He wont have any disease? When should I start chanting this mantra? I have sent you an email.... Thank you so much for quick response. I have stammering since my childhood.Can this mantra alsa help an adult to get rid of stammering? How many months does this mantra be recited to get speech recovery? Namaste, my son is 6 years old and moderately autistic. He has some words but cannot talk in sentences. He also has high anxiety. Pls guide as to when I can start chanting this mantra. Thank you. Please send me an email at jyotishremedy@gmail.com I will have to see his horoscope in detail. My son is 5 yrs old and has autism and not talking yet. We have been doing therapy from 2 yrs with very little improvement. Please suggest a good day and time for me to start this mantra. My son is 5 yrs old and not talking yet. He has autism and he has been getting therapy from last 2 yrs with very little improvement. Please suggest a good day for me to start this mantra. Hello guruji.. my son is 4 year old and he is having some delay in speech. He understands everything.. but struggle talking words spoken language. Also having no eye contact. Kindly suggest mea a good auspicious day to start the mantra for him. I have a 6 years old boy who has moderate autism and non verbal. No words till now and learnability issue. I had shown to 2-3 astrologers and had done puja/ home also.i have done energy healing also. But No significant changes till now. Please guide me when to start chanting the mantra. And anything else I need to do. I have twins one with moderate autism and non verbal..speek some words only when forced..and other with mild autism..who can speek sentences but difficulty in making friends..we are doing therapies from 3 years now..but very less improovement..please suggest when can i start chanting these mantras?and can i chant for my kids? Hello sir my son Rudransh is 2year 5 months old. He is not interactive with people. He understands thing but does not speak. Kindly guide me when should I start chanting mantra for my son.